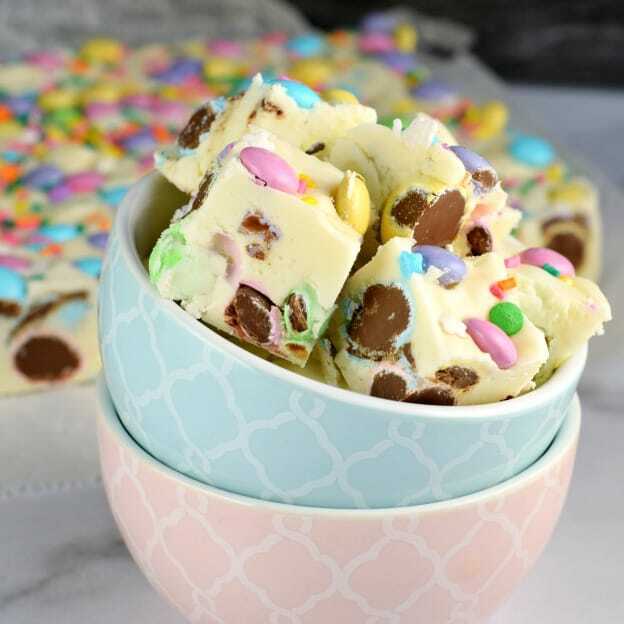 No matter the Spring holiday, this easy Easter Fudge recipe is perfect. Vanilla Fudge with pastel candies and sprinkles! I’m back with another super easy, yet delicious fudge recipe! Creating fudge for any occasion is easy once you’ve learned the basics. 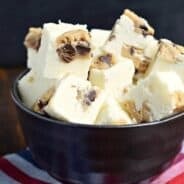 How to make Vanilla Fudge is my guide to creating the perfect vanilla base recipe. 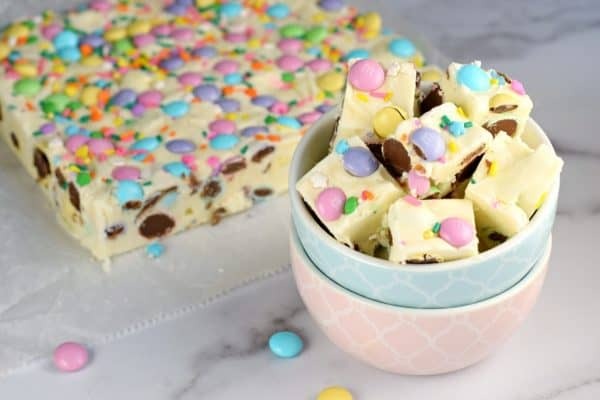 Today, using that simple fudge recipe, I’ve made a fun Easter Fudge treat! Start by creating a Vanilla Fudge. Knowing How to Make Fudge is a simple trick that will make you the hit of every party! Making fudge is easier than you think and it is so easy to personalize with your favorite ingredients and flavor combinations. You could also make Chocolate Fudge if you prefer! 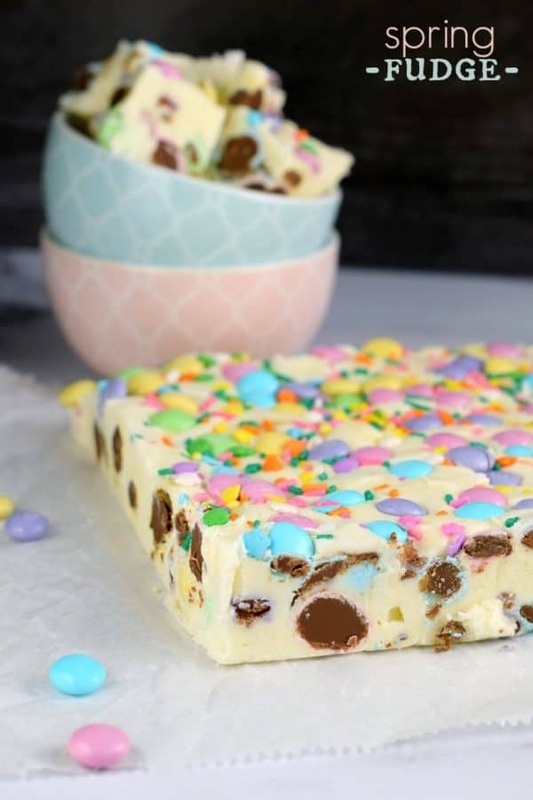 You’ll also want to choose what kind of candy to add in to your Easter Fudge recipe! I chose Hershey Chocolate Eggs and some pastel M&M’s candies. You know what else would be great? Whoppers. This Malt Ball Fudge is still one of my favorites. Just remember if you’re choosing Robin Eggs, they’ll get soft and chewy after a few days, so make it right before your event. 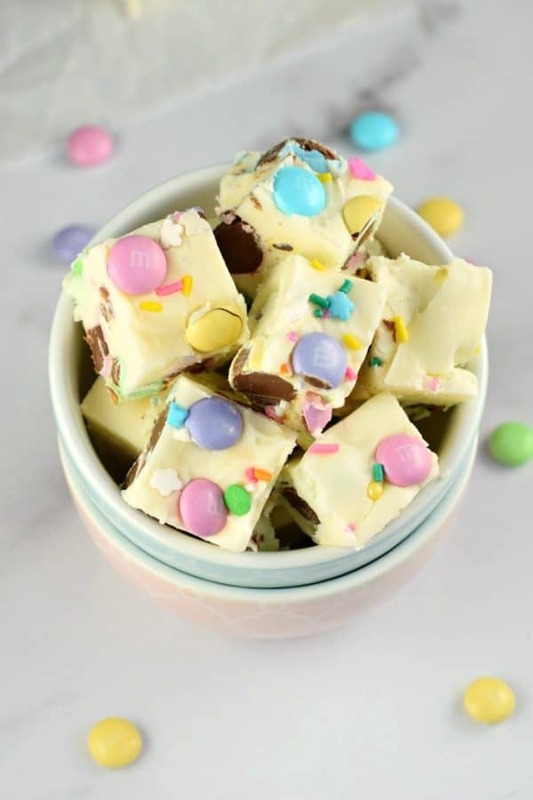 Today’s Easter Fudge recipe though can last weeks! Prepare an 8-inch square baking dish by lining it with parchment paper. PRO TIP: use binder clips to secure the parchment paper to the sides of the pan! Add white chocolate chips and marshmallow cream to a large mixing bowl (that’s attached to an electric mixer). In a large saucepan, add butter, sugar, heavy cream, and salt. Bring to a boil over medium high heat, stirring frequently. Once boiling, continue to boil for a full 5 minutes, stirring constantly. After 5 minutes, remove from heat and pour into mixing bowl with the white chocolate. Using the electric mixer, blend for about one minutes, until white chocolate chips are melted and smooth. 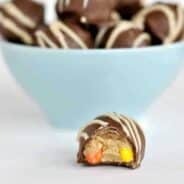 Add your desired candies, folding them in gently and quickly. Pour mixture into prepared dish. Top with sprinkles (if desired) and more candy for a finishing touch! Allow to set for about two hours at room temperature (or overnight). You can also refrigerate to speed set, if desired. For best results, allow the fudge to set up at room temperature. Once it’s set, slide it into a large, gallon sized, ziploc freezer bag and squeeze out all the air. Don’t cut the fudge until you need it. This keeps it fresh longer! And don’t chill it unless you want it to last more than two weeks. First, wrap the uncut fudge in plastic wrap then slide into a large ziploc freezer bag, pressing out all the air. Freeze for up to two months. To thaw, place bag on counter to come to room temperature (usually best overnight). Slice and enjoy! 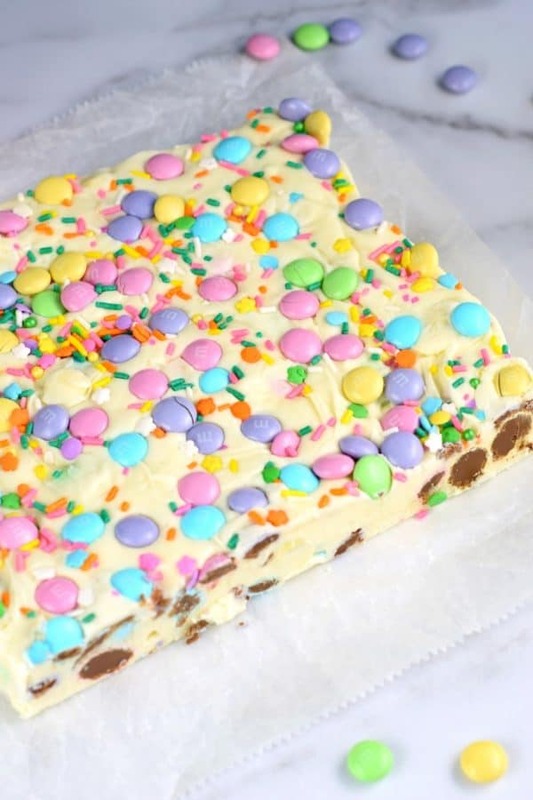 While we know you’ll be enjoying this Easter Fudge for dessert, what should you put on your dinner table? Here are some of our favorites! First, everyone needs perfect hard boiled eggs for the holiday. I use my Instant Pot to create the BEST ones ever. Using the 5-5-5 method, my Instant Pot Hard Boiled Egg recipe comes out perfect every single time, and they peel so easily. Easy, 4 ingredient Pistachio Fluff Salad, also known simply as Pistachio Salad! Best served with friends and family, this recipe makes a great potluck dish! This Carrot Cake Cheesecake Cake is a showstopper! Layers of homemade carrot cake, a cheesecake center and it’s all topped with a delicious cream cheese frosting! The most delicious, from scratch, white cake recipe is used to create this perfect Coconut Cake! Sweet Coconut Truffles are perfect for Easter, or any time of year! You’re only a couple ingredients away from one of these awesome treats! Add white chocolate chips and marshmallow cream to a large mixing bowl. Set aside. In a large, heavy saucepan, add butter, cream, sugar and salt. Bring to a boil over medium high heat, stirring frequently. Once boiling, continue to boil for a full 5 minutes, stirring constantly. Remove from heat and pour over white chocolate and marshmallow cream. Using an electric mixer, blend for about one minute, until chips or morsels are melted and mixture is smooth. Add candies and fold them in with a spoon, gently. Pour mixture into prepared baking dish. Immediately top with sprinkles (and any extra candies you would like). Allow to set at room temperature for two hours (or overnight), covered with a piece of plastic wrap. Once set, cut into bite sized pieces and store in an airtight container in the refrigerator for up to two weeks. 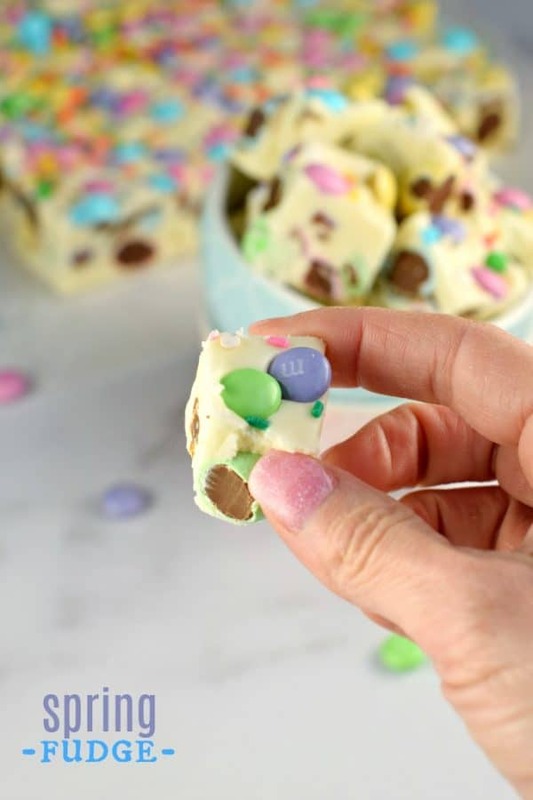 I love this idea to turn fudge into an Easter treat! It would look great in the kids Easter baskets and some left over for us big kids. And, as I always say, M&Ms and sprinkles make everything better. This fudge was spectacular! It’s creamy, melts right in your mouth, and the texture is perfection. Definitely making this again! 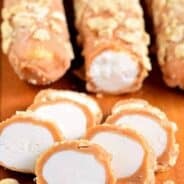 delicious recipe and looks simple to make.